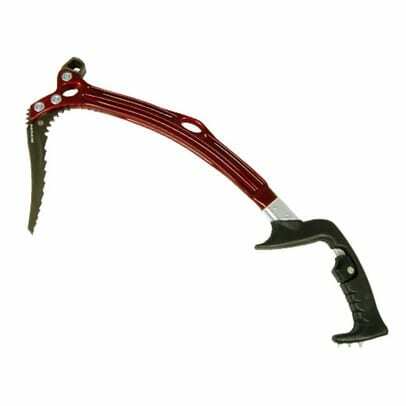 When buying a run of the mill ice axe for walking or alpine mountaineering it is hard to go too wrong. Most axes will more or less do the job. But when it comes to technical climbing tools you are entering an area of huge specialisation and personal preference. The key issue for many climbers is how comfortably an ice tool feels in the hand, how well it swings and how well it places, or bites, in the ice. You also want to consider the extent to which you will be climbing pure ice or whether you will be doing mixed climbing, in which case you will want an ice tool that is also suitable for dry-tooling (placing in rock). Also remember that these are pretty specialized tools so that they won’t really do a good job when it comes to double-duty as an alpine ice axe for long approaches. You will probably want to look only for an ice tool with a replaceable pick. A couple of seasons’ worth of hard climbing and you can be pretty sure you will have worn your old one out. Fortunately, most good ice tools these days do have replaceable heads. The other big decision you have to make is whether to go leashless. A couple of years back it seemed a mad idea and all ice tools came with attachments for firmly fitted wrist straps to hold you in place. In a pinch you could even use them to grab a rest. But they also make for clumsy tools and in the past decade or so leashes have gone out of fashion and instead you now have tools with amazing ergonomic grips. Ideally you will want to try out a couple before you buy. Find a store with an ice wall that will let you test a couple because although all will do the job, only one will fit your hand really well. The truth is also that climbers get really attached to their ice tools. It is a deep loyalty that is not easily swayed. So choose wisely the first time around because you may well find that you don’t change again. Here are some comments on a couple of popular ice tools out there. This is a ice tool that is really causing a stir. Its curved shaft is made from a single piece of aluminum, which makes it lighter and stronger than the other tools out there. It has the usual ergonomic grip and it also features a replaceable head. This is another well-regarded tool from a great company. It also comes in a single shaft these days. It comes with a quick release leash that you either love or hate, so try one out first. This is an update of an old classic that has legions of fans. It is light, swings nicely and is great for climbing frozen waterfalls.